Documenting the turmoil in Kashmir, over a span of two decades 1986 – 2016, a book of photographs, titled ‘Witness’ was launched in Delhi on February 16. It has been doing very well in the market, reports suggest. The book contains more than two hundred photographs of nine photo-journalists captured from 1986 to 2016. All of the photo journalists are from Kashmir working permanently on Kashmir beat and one of them Sumit Dayal is a freelancer. “The book is compilation of photographs of Kashmir and presents a visual narrative of the years of disturbances,” ace photographer Merajuddin said. He is one of the nine photo-journalists who have contributed to the book. “The book will not only serve as a visual document of the events in Kashmir that took place in Kashmir, rather, whoever sees this book he will become a witness to the happening of Kashmir,” Merajuddin added. Merajuddin has contributed almost 27 photographs to the book. From black and white era, those pictures offer a glimpse of the Kashmir that existed before turmoil took over. Then his contributions offer an idea how life looked like during the amorphous era of militancy. Edited by Sanjay Kak, a noted Kashmiri film-maker, the author says the book is primarily a timeline of emotions and the feelings than being a timeline of history. The book is published under the label of Yaarbal Publications, perhaps owned by Kak. “It is not meant to be a timeline of history. Rather it is a timeline of emotions which have been interpreted by the photographers over these years,” Kak said at the book release function. 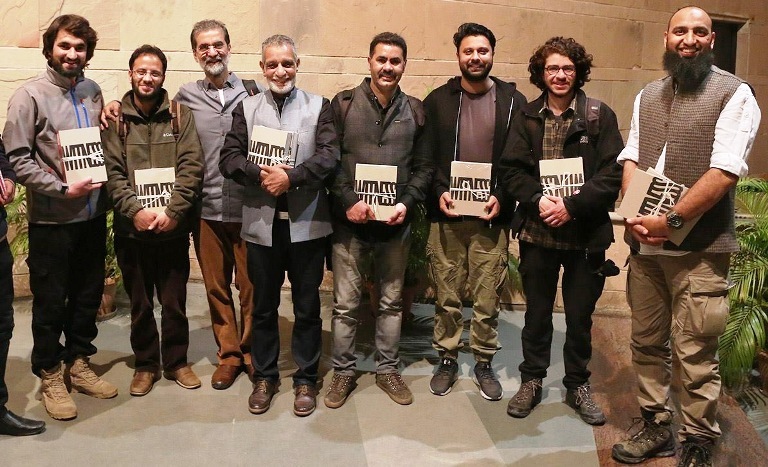 At a glittering function in the India Habitat Centre, where the book was launched, the contributing photographers shared their experiences about covering Kashmir, its life and the crisis. Apart from Merajuddin, the photographers include Javed Dar, Altaf Qadri, Showkat Nanda, Azaan Shah, Javed Shah, Sheharyar Hussaini, Dar Yasin and Sumit Dayal. The function was attended by a good gathering including hundreds of Kashmiri students and professionals. Noted public intellectual Arundhati Roy hosted the photographers on the eve of book launch. She also spoke to them and heard their experiences.